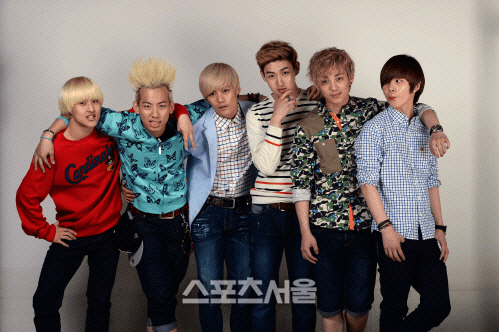 A six member band under the Nega Network label, LC9 had their debut in May 2013. Their fist song/MV was Mama Beat which was released in 2 versions. A literally hard hitting version and a slightly softer and cute version showing the fans both aspects of the groups personas. Gain was a featured artist on both. They have about 3 1/2 million views on Youtube and their fanclub was known as Love Beat. The six members were Rasa, E.Den, J-Hyo, King, Jun, and AO. They came out with a second song in 2014 called East of Eden, a much under-rated song in my opinion. By then they were down to 4 members with E.Den having returned to Canada to continue his education and Rasa doing his stint in the military. Their contract was not renewed in December of 2015 and the official disbanding announcement in January of 2016. I don’t what everyone is doing now, but I found E.Den has a youtube channel if you are interested in what an idol does after he’s no longer an idol. I’m sorry to see this group disband as I thought they had a lot of potential. Good luck to all the past members and I hope they succeed in their new endeavours.